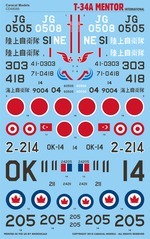 Caracal Models CD48086 - T-34A Mentor International"
This limited edition decal sheet was designed to fit the upcoming Minicraft 1/48 T-34A kit. It was professionally screen printed by Microscale in the US. We will start shipping this sheet on June 18, 2018. You can preorder this decal sheet securely with your credit card or PayPal account now.